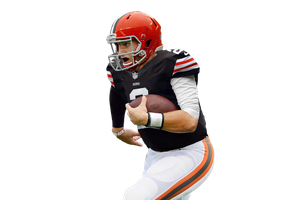 Manziel could be a good QB in the NFL, but his chances of doing so are greatly, greatly reduced by playing for the Cleveland Browns. And no poo, a 6 year veteran (Hoyer) is performing better than a rookie? WOW that is insightful. I hope the best for the guy - he doesn't deserve to be castrated before he's even played a single game. This is ridiculous. But it's absolutely too soon to know for sure. That's not even a question. At this point, frankly I'm bored with the whole discussion. It's not like there's anything concrete to judge by yet Its all just a whole lot of back and forth speculation. Welp, since he did poorly guess they should cut him and start over. Jimmy was ahead of Cam too. Did our GM say Jimmy was ahead of Cam by a substantial margin? “First of all, I don’t think we’ve ever said we don’t want him running around. We’re going to put him in situations where he can execute an offense that will give us the best chance to win,” Pettine said. “It’s coach’s decision,” he said Thursday on NFL Network . “Last year we ran it a lot. If he wants to use a sprinkle, a dash, whatever he decides, that’s his take, and I’m all for it. A. They latch on those guys so not to make it obvious. I wouldn't imagine the media would continue bashing on Wilson and RG3 in such a, (as per Charles Barkley) 'black sport' in this modern era. And I seriously doubt anybody here 'hates' RG3. They just don't think he's that good. Maybe that's enough to constitute 'hate' in your mind, but most of us don't take it that seriously. Unfortunately there are quite a few people here who take it seriously enough to openly mock him about his injury from his rookie year. I cannot imagine that you have not seen the "RGknee" comments. If ridiculing someone for suffering a possible career injury is not hate don't know what is. I've seen them, but my understanding of that was always as a comment on his fragility, not any desire to see him hurt again. If you think differently, I'd say ask someone who calls him that how they mean it. I think they realize the only way they can get Manziel on the field is to use that. What's missing is that Manziel was never a read-option QB. His bread and butter was standing 10 seconds behind that stout OL and then run 10 yards backward and then heave it to a college type wide open receiver. He won't be able to do that in the NFL because nobody's open in the NFL. They really gonna get that kid killed. 4.68 speed is slow in the NFL. Your tinfoil hat is wrapped a little too tight. Regular season can't come quicker, the Manziel stories are getting annoying. I hope they dont burn neutralize what makes him special with all this extra bs they pulling. ..